Can Roger Federer regain the ATP World #1 ranking in 2012? You are here: Home / Pro Players / Can Federer be #1 in 2012? 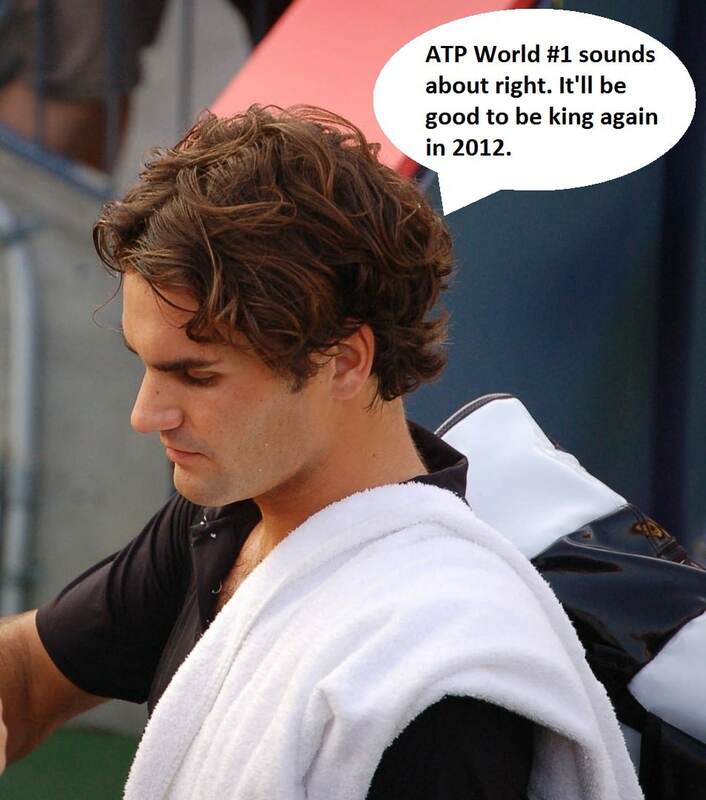 Can Federer be #1 in 2012? Now that the regular 2011 tennis season is officially (officially) over, and Roger Federer finished out the ATP World Tour Finals as the champion, this begs the question of Federer’s 2012 bid for the #1 spot…again. Federer should absolutely pursue another couple of weeks as the world #1, after all, he would break yet another tennis record; he’s right behind American Pete Sampras in number of weeks at #1 (not consecutively, weeks total). Roger Federer has a total of 285 weeks accumulated at #1, where Pete Sampras has one-upped him with 286 weeks at #1. I’m pretty sure that would be the icing on the Federer tennis career cake, most weeks at #1, most major titles, 30 Masters 1000 finals, over $66 million career prize money, and a tennis court full of other records. What does Roger Federer have to do to reclaim the #1 spot? He’s got some pretty stiff competition ahead of him in the #2 and #1 spot, Rafael Nadal and Novak Djokovic. Both of which have beaten the Swiss maestro numerous times. These two players are obviously highly talented tennis players and have been able to beat Roger more times than I’d like to remember. However, Nadal and Djokovic bot have plenty of career left in them, whereas Roger should be seriously considering retirement, being that he’s a father of two and in his 30’s. Will Federer regain world #1 again? Beyond the obvious of having to get past his nemesis’, Federer has to keep his fitness in mind. Yeah, I agree with you, Federer is in amazing shape and has yet to EVER pull out of a tennis tournament from injury (his entire ATP career and Challenger career he never retired from a match), though it’s something that he should be thinking about heavily. Fortunately, Roger is not a major scrambler like Nadal, Djokovic and most of the field, he’s got some of the best footwork the sport has ever seen, so that’s certainly helps him avoid injury. How much more can Federer’s body take? Who knows, right now there are no signs of what injuries he could potentially incur in 2012. Federer is also going to have to take close look at his 2o12 tournament schedule. The rankings are all about points, therefore, Federer is going to have to look at defending his points as well as picking up some fresh points to climb into the #2 and #1 spot. It’s no easy feat, he’ll have to do well in Australia, the grass court season, the clay, and the US hard court swing. Clearly, we all want the Swiss to play every tournament on the schedule, because we all love watching tennis perfection, but; that’s just not possible. He’ll have to be really careful to not over do it. As far as Roger’s tennis game goes, well I’m obviously not his coach, but as an observer I have really enjoyed his game from the last 3 tournaments he played. If he were to play more tennis like he did in China, Paris, and London he will be virtually unstoppable. If Federer were to play at the baseline and come in off a decent to good approach, he should be able to get some quick points. I think that Federer should try to keep the points long-ish (15+ strokes), this way he wears down even the most fit competitors. Federer is already a great server, arguably one of the best, though he should utilize the serve he hits out wide, it pulls players off the court and gives Federer and easy put away volley or groundstroke. Basically, the key factors for Roger Federer to get back to #1 are keep his schedule manageable, play smart tennis, and maintain his fitness. Of course, it would absolutely help if his opponents played poorly and made it easy for Fed to get those points. One point that I didn’t mention here is that Federer will have the driving force of us, the spectators. No matter where you are from, or who your favorite tennis player is, you can’t help but cheer for Federers’ greatness and we all want him to smash another tennis record. I think we are all starting to recognize that Roger is nearing the end of his career and I’m sure we all want him to succeed, therefore we could very well energize him to play out the tough matches. In my honest opinion, I absolutely believe that Roger Federer can not only regain the men’s world #1 ranking, he can also be #1 for over 300 weeks. I’m sure you all agree with me, he’s the king of tennis and we all know that he is still the greatest tennis player the sport has ever seen.